Say hello to my new little brother, Oliver Matthew, born today at 2:25 PM. He weighs 6 lbs. 9 oz., and is 19.5 inches long. I guess he's pretty cute, but there's no way I'm letting him play with any of MY toys!! Hi Noah, here comes competition. I'm glad to sse you have long hair again. Just thought I'd mix things up with a trite comment. Good work. I can't wait to see Oliver when he is unwrapped. Big brother Noah, you're cute. Congratulations Amy and Joe!! Scott and I hope we can come visit all 4 of you sometime in the next few months! oh YAY!!!!!! i can't wait for christmas so i can come see you guys and meet the new little guy!!! oh yay! I CAN'T WAIT TO MEET MY NEWEST LITTLE NEPHEW. 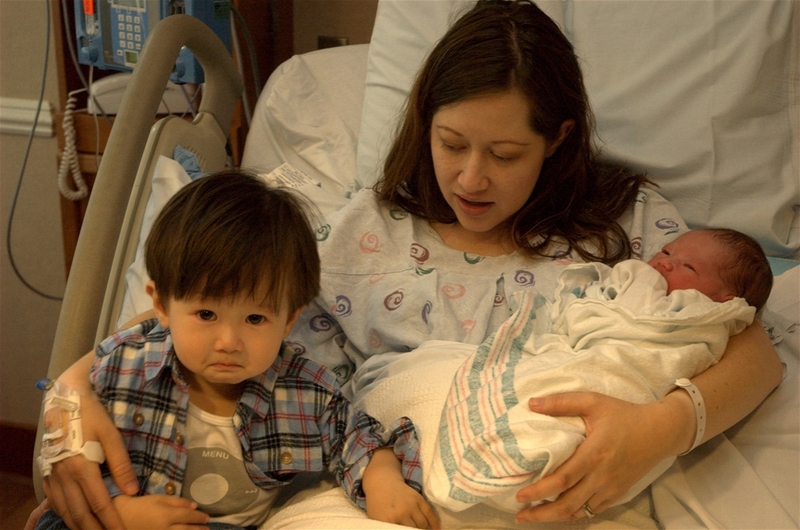 HEY NOAH, I THINK I HAD THE SAME LOOK ON MY FACE WHEN YOUR MOMMY WAS BORN, BUT DON'T WORRY... SOME DAY YOU WILL LOVE YOUR LITTLE BROTHER AS MUCH AS I LOVE MY LITTLE SISTER. HUGS & KISSES!!! Congratulations, Joe, Amy, and Noah. What a beautiful baby. We all enjoyed Noah so much, now it comes Oliver. Our pleasure will be doubled for sure. Will see you all in a week. Noah: Smile a little, bring back your cute face, please. congratulations!!! is that an ipod graphic on noah's shirt?? i find this hilarious. anyhoo...congrats...are you going to start a new blog for oliver now? Aww! Look at that face --- he already knows that his world has changed forever. Congratulations you guys. Miss ya all! Congratulations, you guys looks so lovely. Can't wait to see you in person! Noah will be a wonderful big brother to Oliver. Too cute! Congratulations Amy and Joe! I agree, Noah can tell what's up immediately, and he rails against it. Very true photo, very good. I am happy to see the Cheng family is expanding so successfully. May God bless your home and both Noah and Oliver.